This card is all about texture. It simply begs to be touched, doesn't it? And, if you do touch it, it is a veritable tactile adventure. My Big Shot played a huge role in the creation of this multi-layered beauty. I used Framelits and Embossing Folders. How did I EVER live without that phenomenal machine before it came into my life? My Big Shot is the most essential tool in my papercrafting arsenal. 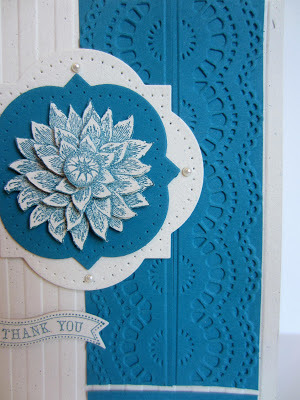 While I love, love, LOVE the texture, I think the true star of this card is the flower. A little time-consuming, this fussy cutting may not be for everyone, but as you already know about me, I adore paper cutting. To get the three-dimensional effect in the flower, you need to stamp it four separate times. The first flower you cut is the entire flower. The second flower is simply the outer layer of petals removed. The third layer is comprised of the star-shaped innermost petals, finishing up with the fourth level -- just the button-shaped piece in the very center of the flower. 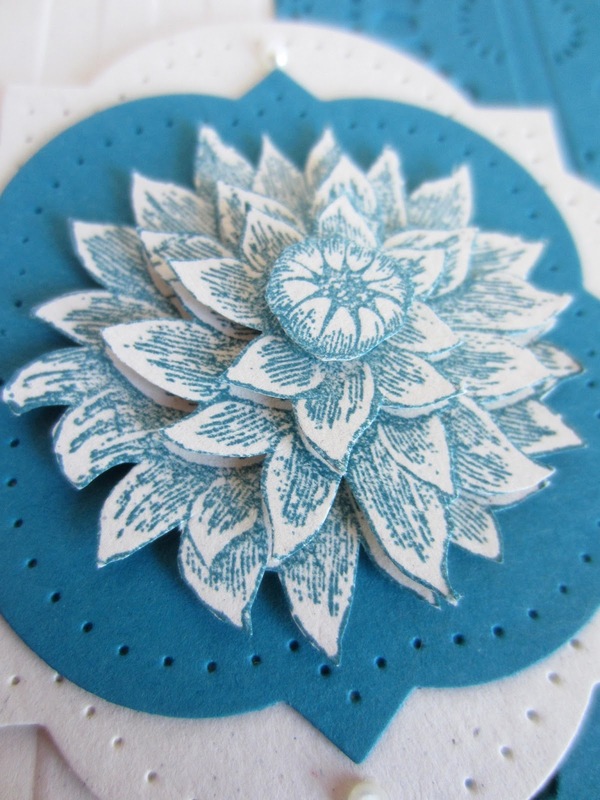 The flower is then put together with a Stampin' Dimensional between each layer. Each layer of the flower is laid atop its twin on the previous layer. Very easy. Very precise. Very elegant. The Island Indigo/Naturals Ivory color combination is exquisite. Agreed? Run the card front through the Big Shot inside the Stripes Embossing Folder. Simply wrap the back of the card underneath the embossing folder while running it through the Big Shot. Run each of two 1 1/2" x 5" strips of Island Indigo card stock through the Big Shot inside the Delicate Designs Folders, making sure you line the strip inside the folder at the same point for both of them. Otherwise, when laid side by side, the designs won't match. On a scrap of Naturals Ivory card stock, stamp the flower FOUR TIMES in Island Indigo ink. On the first flower, cut out the whole flower. On the second flower, cut on the second layer of petals, then the third layer of petals, and finally, the circle center. 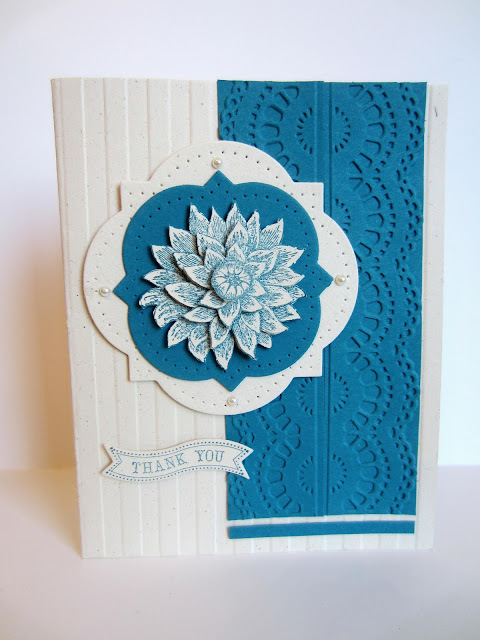 With Stampin' Dimensionals, match up the flower parts and adhere the flower together. From a piece of Naturals Ivory card stock, use the third smallest of the Window Frames Collection Framelits to cut a frame. Do the same with the second smallest from Island Indigo card stock. With the appropriate piece from the Festive Paper Piercing Pack, pierce holes all around each of the frames. Adhere the frames together as in the sample. Then attach the flower to the center. Add a medium Basic Pearl to each of the sides of the largest frame. Adhere this completed focal point to the card with a few Stampin' Dimensionals. On a scrap of Naturals White card stock, stamp Thank You in Island Indigo ink. Cut out with the Bitty Banners Framelit in the Big Shot. To prevent the Framelit from moving from its spot, stick a Post It Note over the Framelit and stamped image. Adhere to the card front with pieces of Stampin' Dimensionals. Adhere a thin strip, about 1/8" x 2 1/4", of Island Indigo card stock beneath the embossed piece, leaving a small gap of the ivory background showing through. 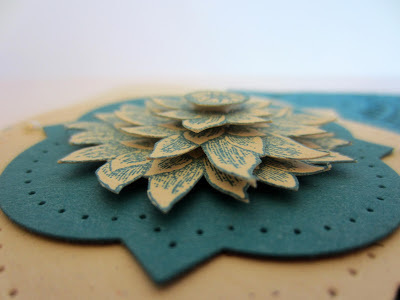 If I do succeed in inspiring you -- in planting little seedlings of papercrafting ideas -- I would love it if you would place an order or two (or three??) naming me as your Stampin' Up! demonstrator. Love all the texture! Thanks for sharing. What a gorgeous card! 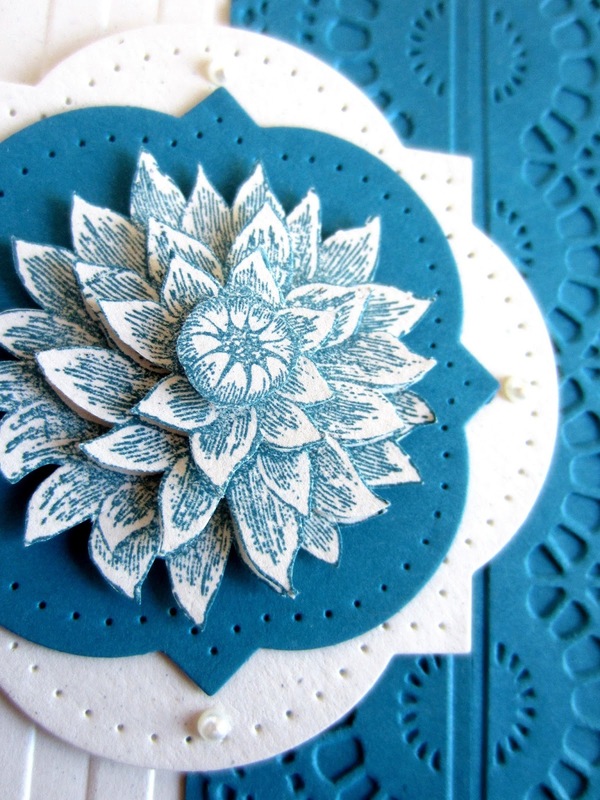 All the layers, texture and dimension just make this a total stand out card. Thanks so much for linking up at the Real Family Fun link party! Hope to see you next week. Gorgeous! so many dimensions and layers! You are one talented lady! That really is a pretty card. Looks like I need the naturals! This is a beautiful card, I love layers on mine as well!! Very pretty!! Thanks for linking up at Family Fun Friday at http://happyandblessedhome.com! Wow, I would love to get a card like that - it's so pretty and unique! Thanks for showing this. Wow, this is so intricate! The attention to detail and craftsmanship is a great way to say thank you. Beautiful! Oh, this card is so beautiful! You did an amazing job. Thank you so much for sharing at A Bouquet of Talent this week! Have a wonderful Memorial Day weekend. Love it! Thanks so much for sharing on The Creative HomeAcre Hop! Hi! Your Lush Layers is one of our Featured Posts from our last week's Brag About It! See it tomorrow when you come by to link up! Thanks so much, we really loved this. BeBetsy Link and Hop!